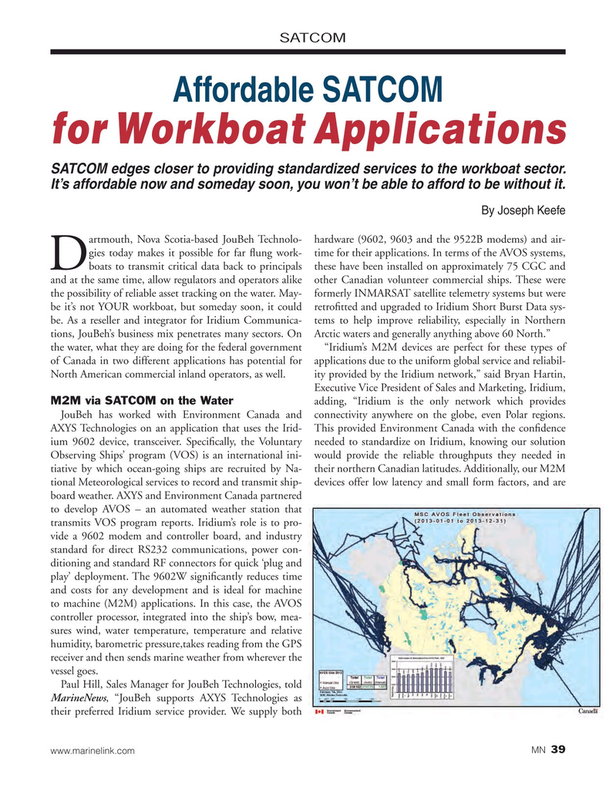 SATCOM edges closer to providing standardized services to the workboat sector. It’s affordable now and someday soon, you won’t be able to afford to be without it. JouBeh has worked with Environment Canada and connectivity anywhere on the globe, even Polar regions. Observing Ships’ program (VOS) is an international ini- would provide the reliable throughputs they needed in tiative by which ocean-going ships are recruited by Na- their northern Canadian latitudes. Additionally, our M2M tional Meteorological services to record and transmit ship- devices offer low latency and small form factors, and are board weather. AXYS and Environment Canada partnered to develop AVOS – an automated weather station that transmits VOS program reports. Iridium’s role is to pro- vide a 9602 modem and controller board, and industry standard for direct RS232 communications, power con- ditioning and standard RF connectors for quick ‘plug and play’ deployment. The 9602W signi? cantly reduces time and costs for any development and is ideal for machine to machine (M2M) applications. In this case, the AVOS controller processor, integrated into the ship’s bow, mea- sures wind, water temperature, temperature and relative humidity, barometric pressure,takes reading from the GPS receiver and then sends marine weather from wherever the vessel goes.